The Dunlop MSA British Touring Car Championship heads north west to Oulton Park this June (7/8) after three thrilling opening rounds, with five different winners and a close battle at the top of the title standings. With three wins, title defender Andrew Jordan heads the BTCC’s Magnificent Seven champions. However Gordon Shedden is just seven points behind, with Colin Turkington, Matt Neal and Jason Plato within striking distance. With 67 points on offer, any one of them could lead the standings after the three races held on the series’ most picturesque and challenging circuit. The top five will face a tough challenge from the chasing pack, led by Rob Collard, Mat Jackson and Sam Tordoff, who has already taken a w in this season. Local hero Adam Morgan from Blackburn is aiming for a win in front of his home crowd with the stunning Wix Racing Mercedes A-Class, whilst returning champions Fabrizio Giovanardi and Alain Menu, the latter a multiple winner at Oulton Park, will also be in contention. With a record 31 cars entered for the season, the full Oulton Park International circuit, featuring the banked Shell Oils hairpin, will be used for the first time since the late 1990s. Fans will also have the chance to meet the drivers on Sunday morning with a free pitwalk and autograph session. 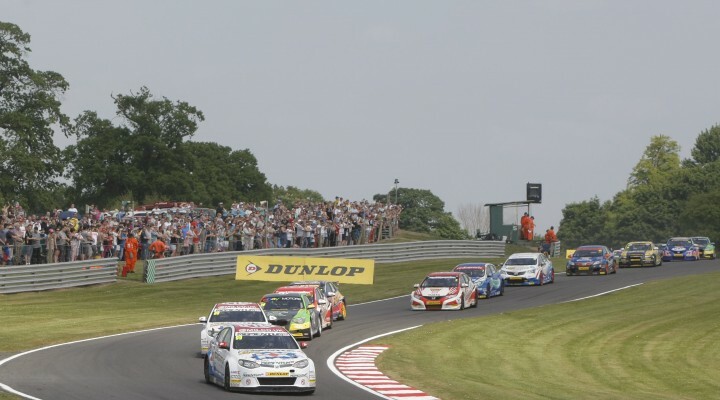 The Oulton Park round will also feature an extra helping of BTCC action, with a one-off support appearance from the Super Touring Trophy, a series for 80s and 90s Touring Cars. The grid is expected to feature a number of legendary cars, including the Sie rra Cosworth, BMW M3, Honda Accord, Nissan Primera and Renault Laguna. Also lining up for two races will be double champion John Cleland, with his 1998 Vauxhall Vectra, and ITV BTCC commentator Tim Harvey is set to take part too. The weekend will also feature action on the International circuit from the Ginetta Juniors, Ginetta GT Supercup, Renault UK Clio Cup and Formula Ford GB championships. In addition, there will be off-track fun with extreme adventures challenges, a free children’s adventure playground, free face painting, and a trade village.